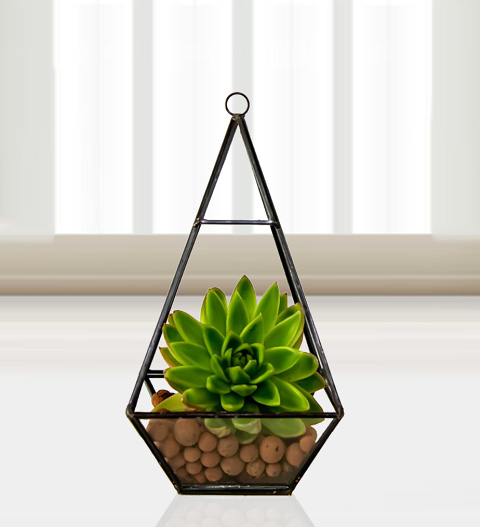 This stunning succulent looks superb in its glass terrarium home. Excellent for birthdays, as a housewarming gift, or any other happy occasion. The best part about this gift is that it arrives unarranged. You will receive the glass terrarium along with the clay balls and the succulent, packaged separately of course. The fun in this gift is that you get to make it yourself. Long-lasting and thoughtful, you can also add some fairy lights to make this display even more gorgeous. Potting and care instructions are all included with each terrarium. For best results, it's important to ensure that your succulent is watered at regular intervals and plant food will also keep your plant happy. Fairy lights should always be removed when watering and replaced once you are done.